Sorting through a large pile of used clothes and household items, Hsiao Hsiu-chu is the picture of a new-age Buddhist. The 63-year-old retiree used to practice her religion by praying at temples, but now she volunteers seven days a week at a recycling centre to raise funds for Taiwan's Buddhist association Tzu Chi. "I have no time to go to temples. Praying is not important. Coming here every day is like praying," said Ms Hsiao. This is not how most people practice Buddhism in Chinese-speaking or even non-Chinese Buddhist societies. Their faith is usually self-focused: praying for protection in their current life and to be born into a better life after they die. But Taiwan is leading a quiet, yet powerful movement that has turned traditional Buddhism on its head, converting many Buddhists such as Ms Hsiao into doers, not just believers. Burning paper money and incense is discouraged - it's bad for the environment. Going to temples is low priority. Even praying too much is frowned upon. The focus now is on what the Taiwanese call "humanistic Buddhism" - caring for others and for society. It returns Buddhists to the core principles of Buddhism - speaking good words, thinking good thoughts and doing good deeds. "According to Buddhism, it's not enough to have benefits for oneself only, you must also have benefits for others. We should try to help as many people as we can to be relieved of suffering," said Head Abbot Hsin Bao of another major Taiwanese Buddhist association, Fo Guang Shan. The practice has helped Taiwan's leading Buddhist organisations expand in unprecedented ways. Tzu Chi Foundation - which is at the vanguard of the movement - has seven million followers, including two million overseas. Its 100,000 volunteers in Taiwan are seen everywhere in their trademark blue shirts and white trousers. They recycle plastic bottles to raise charity funds, check on elderly people living alone, provide support to poor and at-risk families, tutor children and help respond to natural disasters. Another influential Taiwanese Buddhist group, Dharma Drum Mountain, regularly holds "Buddhism 101" classes to teach people how to apply the philosophy to their lives. In one recent class for about 200 people, a psychologist used Buddhism's teachings to advise students on how to recognise and work on their own negative emotions, and how to deal with troubled family relations. "Buddhism's teachings can be used everyday and where's the best place to use them? In your family," Yang Pei told the class. Fo Guang Shan, meanwhile, holds youth camps for children. "These organisations are very different from traditional Buddhism," said Kuo Cheng-tian, a professor at National Chengchi University. "They emphasise lay believers running temples and Buddhist organisations, not just monks. And they use ordinary believers to lead charity missions." Image caption Annual cleaning is a big event at the Fo Guang Shan temple in Kaohsiung, in southern Taiwan. Image caption The temple contains thousands of Buddha statues, including 14,800 in the main shrine. Image caption Volunteers and specialists work together to clean these statues, however inaccessible. Image caption People work together as the statues are removed one by one from their homes set into the wall. Image caption Each must be carefully cleaned before being returned to its place for another year. It is unclear how many Buddhists there are in the world. Buddhism is not an institutionalised religion and many Buddhists also believe in other faiths. But some estimates suggest there are half a billion to one billion Buddhists globally, making it the world's fourth largest religion. What makes Taiwanese Buddhism unique is its strong emphasis on helping society. Tzu Chi, for example, has provided post-disaster relief in more than 84 countries, including in the Philippines, where it recently paid 50,000 households to rebuild homes destroyed by Typhoon Haiyan. With growing pressure in their rapidly changing society, people in China are increasingly turning to Buddhism. But while a lot of money has been poured into rebuilding temples destroyed during the Cultural Revolution, and the temples have collected a vast amount in entrance fees or donations, they don't have the practice of giving back to society, said Fu Xinyi, a Nanjing University academic who specialises in Buddhism. "They build temples for tourism, for money, but they don't know how to spread Buddhism's ideology," Mr Fu said. "This is regrettable. Society has so many problems, Buddhism should play its role in helping people and giving them spiritual guidance." Mainland China can learn from Taiwan, he said, but the government's suspicion of religions will limit Taiwanese Buddhists' ability to spread humanistic Buddhism there. "They can spread the ideology, but the actions can't be as big as in Taiwan because the government will feel threatened," Mr Fu said. Still, China's people and even leaders are becoming more familiar with Taiwan's Buddhism. Tzu Chi is the first foreign non-governmental religious organisation to be allowed to set up a branch in China. Chinese President Xi Jinping also recently met with Fo Guang Shan's Master Hsing Yun, who is popular in the mainland. Chinese leaders may be realizing Buddhism can be a stabilising force in society. And although Buddhist groups have traditionally been less active, compared to Christian counterparts, in spreading their religion, that is changing. Taiwan's major Buddhist associations have their own TV channels, publishing houses, and news agencies, as well as hospitals and universities. They send volunteers to schools to teach children about good behaviour, through storytelling. But they say they are not trying to convert non-believers. 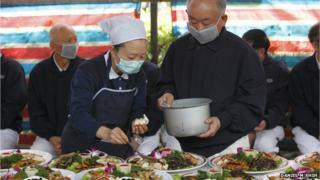 "We see no need for you to be converted; we're not aiming to proselytise," said Chien Tung-yuan, a Tzu Chi spokesman. "From the beginning, Shakyamuni (Buddha) taught people to help those who are suffering, without conditions, and not to want anything in return." Changing the way Buddhism is practiced has not only led to a revival of the religion in Taiwan, but its expansion overseas. Fo Guang Shan, for example, has 200 temples worldwide, including 20 in Europe and 24 in the US, not just for overseas Taiwanese but local people. Dharma Drum Mountain, meanwhile, has 125 chapters worldwide, while Tzu Chi boasts many branches in 48 countries. In Malaysia, its members jumped from 100,000 to one million last year. "We want to use Taiwan as a base to spread Buddhism to mainland China and the rest of the world," said Fo Guang Shan's Head Abbot Hsin Bao. Taiwan is also helping mainland China rediscover the religion. Although Buddhism has nearly 2,000 years of history in China, it had diminished in importance in recent centuries because of wars, political turmoil and suppression, and a focus on modernisation. Millions of Chinese listen to Taiwanese masters' teachings on DVDs or MP3s. They download material from websites and spread them online. With improved relations between the two sides in recent years, many Chinese Buddhists leaders and adherents are now able to travel freely to Taiwan. Taiwan's Buddhists also can more easily spread their message in the mainland, even if it is in low-key ways such as repairing a temple or promoting "reading clubs" - similar to Bible study. Scholars believe Taiwan is playing a key role because many charismatic Buddhist leaders fled to the island after the Communists took over the mainland in 1949. Influenced by the respected late Buddhist leader Taixu's calls for contributing to society to gain enlightenment, the masters and their disciples made the idea a reality. Taiwan's groups were also influenced by Christianity, adopting practices such as doing charity work. At the same time, growing wealth here meant Taiwan's middle class, especially elderly people, have more money and time to help others, as they seek meaning in life. Back at the Taipei recycling centre, more bags of used clothes arrive for Ms Hsiao to sort. She said putting Buddhism's teachings to practice has given her the strength to cope with her mother's sudden death and helped her improve relations with her children. 'It's opened the knot in my heart,' Ms Hsiao said. Her advice to other Buddhists: "Don't just believe in Buddhism, do something to help others."